Epcot is almost like visiting two parks, Future World and the World Showcase. With all there is to do and see in both these worlds it can be difficult to know the best way to tackle the park as whole. Here is our list of the top 8 pro tips for Epcot. Test Track is one of the more popular thrill rides at Epcot and the standby wait time often reflects this. If you want to ride Test Track without waiting in a long line and you don’t have a FastPass+ reservation, go with the single rider line option. You will end up sitting next to a stranger, but you may only wait a couple minutes. Mouse Gear in Future World is a massive store full of all your Disney souvenir and merchandise wants and needs. Whether you’re in the market for Mickey ears, t-shirts, housewares, pins or Christmas decorations, this is where you’ll find it at Epcot. The shops in the World Showcase mostly carry merchandise from the different countries, so if it’s Disney merchandise you’ll looking for, make a point of going to Mouse Gear. It’s also the perfect place to take a break and cool down on those hot and humid Florida days. There is no shortage of amazing table service restaurants at Epcot. Each pavilion in the World Showcase has at least one sit down restaurant and over in Future World there is the Coral Reef as well as The Garden Grill. Each restaurant is unique in its theming and cuisine, so it’s important that you make the right choice for you and your party. Take a quick look at the menus online or on the My Disney Experience app to make sure that the restaurant you choose will have something you’ll like and offer a dining experience that will make for a memorable day in the park. After a long day at the park it’s nice if you can finish it off by sitting down watching the spectacular firework show IllumiNations: Reflections of Earth over World Showcase Lagoon. There are a number of benches around the World Showcase, but people do claim them early. If you want to find a spot to sit for IllumiNations, it’s best to start scoping out a spot at least 30 minutes before show time. Another option is to make a late dinner reservation at a restaurant with a view of the lagoon. Epcot offers two character dining experiences which are great if you’re traveling with children or if you love meeting characters. Both The Garden Grill and the Akershus Royal Banquet Hall have character dining experiences and both restaurants are open for breakfast, lunch and dinner. The Garden Grill is the spot to meet Chip ‘N Dale and friends and Akershus is the place to meet princesses. These character dining experiences are a great way to have a delicious meal with loved ones and meet characters without waiting in line. If you really want to see Epcot at its finest, visit during a festival. In late winter Epcot offers the Festival of Arts which hosts beautiful presentations of the arts through paintings to masterful food. The spring season offers the International Flower & Garden Festival. 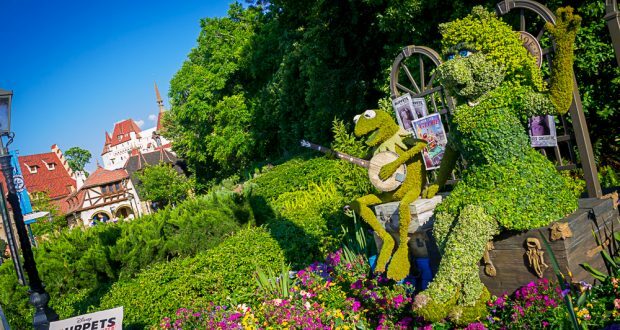 The park comes alive with color, and there are topiaries of your favorite Disney characters. Each fall the International Food & Wine Festival is held. It features dishes and beverages from around the world that you can’t usually find in the park. Epcot also has an early winter festival called the Epcot International Festival of the Holidays. This is perfect time to take in all the holidays from around the world! These festivals include seminars, demonstrations, free concerts, and event merchandise. The festivals are included with park admission, although there is a fee for some of the extras. The three most popular attractions with the longest wait time are Frozen Ever After, Soarin’, and Test Track. Epcot is on a Tiered FastPass System, meaning you can only select one of these to FastPass when picking your initial three FastPass options. If you arrive at the park right when it opens, you should have no problem hitting both Soarin’ and Test Track without extremely long lines. Our recommendation is to FastPass Frozen Ever After early afternoon, head straight to Soarin’ at park open, then head to Test Track. If the standby line for Test Track is too long, you can always check out the Single Rider line. One of the best ways to enjoy Epcot is to take your time exploring all it has to offer, and that may take more than one visit. Future World and the World Showcase are full of such wonderful things to see and do, so take your time and savor the details, admire the work of the Imagineers and enjoy the rich culture in each of the pavilions in the World Showcase and the innovation and imagination in Future World. What are your pro trips for guests visiting Epcot?